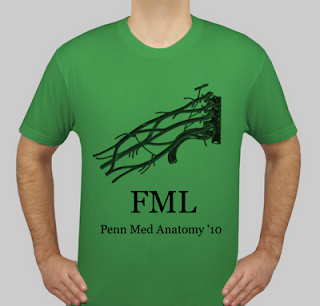 Tomorrow - Monday 12/13 - is my last official day of anatomy lab. It's been a very long and winding road (for the second exam we had to know 99 muscles, their innervations and blood supplies... good times!) The exam a week from Tuesday will be by far the hardest of the 3 anatomy exams. I've truly come to believe the Head and Neck regions (and I'm not even counting the brain...) were designed by God (or evolution, or whatever) for one purpose only: to drive medical students crazy. I mean... seriously. Some of the wiring makes no sense. Why exit the skull (jugular foramen), enter it again (around the ear), and then exit it again (via foramen ovale) to innervate the Parotid gland?! (thank you lesser petrosal nerve... yay for the damn glossopharyngeal cranial nerve). And on that note... who knew the skull had so many holes in it?! Having said all that, I don't think I'll ever have another class as amazing as Gross Anatomy. I'm extremely humbled that people have donated their bodies to science so we can train to become the best doctors we can be. I wanted to take a moment to thank the people and the families who help make Gross Anatomy possible. Thank you all so much. Be assured that our class (and medical school classes around the world) have learned an immense amount from cadaver dissections. Lessons we couldn't have learned any other way. Know that any lives we improve and/or save in the future is possible because of the willingness of these selfless people and their families.